Identity crisis, have you ever been through it? If yes, you know how it feels and if no then you might definitely would have come across someone who is going through it. The question is, are there different ways to tackle it? If yes, how and if no then why? 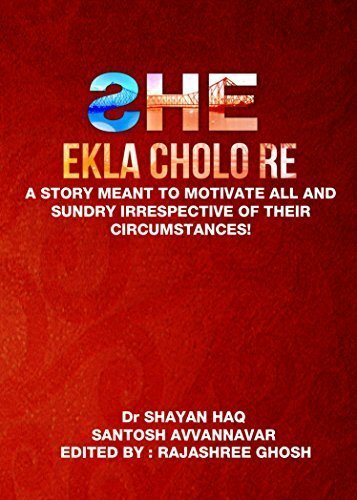 I recently read She : Ekla Cholo Re, which is a very very very short book rather a story of around 50 pages about someone who has gone through different phases of identity and existence sometimes being appreciated and mostly ridiculed and joked of even by their own parent. It talks about the perception of our society towards gender sensitivity and describes how prestige is given preference of choice but fails to answer why and it fails because society at large has failed to accept it. The story is about two lead characters Kusum and Raj, one being the victim of gender sensitivity and the latter being a professor. Both of them meet on a highway and start knowing about each other and when the conversation ends, it evokes a sense of belonging between them, but there is a twist in the story, what if she is not she but she likes he. The story unfolds various myths and it is based in the early 90’s of Calcutta. The blurb of the book says that the inspiration to write this book has come from Rabindranath Tagore’s ‘Ekla Cholo re’ song which urges Kusum to continue despite the fear of abandonment from others and I am sure that’s how the book got its name. Thank you for your comment Ravish. Yes, it's a gripping story. Looking forward to know your thoughts about the book. Do comment and let me know. Thank you Sneh! Do read and when you are done, do share your thoughts with us over here. Thank you Datta Ghosh for your comment. Good review. I have read about it on Tomichan Sir's blog too and hope to read it one day. Thank you Sunaina to reading the review. Do get hold of it, it's a very short book. Looks like an interesting read, Thank you Kaushal for writing about it. Thank you for taking the time to read about it.